Speaking of Research was founded in March 2008 by Tom Holder in a project supported by both Pro-Test and Americans for Medical Progress. Holder had previously been involved in the formation of the Pro-Test movement in the UK, acting as its spokesman from 2006-2011. Since its inception, many scientists and animal research communicators have joined the Speaking of Research committee and contributed to its news blog. The website has a number of Senior Editors who change over time. Speaking of Research members have given talks and presentations about communicating the issue of animal research at seminars and conferences around the world. Among these, they have addressed the Society for Neuroscience, the Society for the Study of Reproduction and the Swedish Research Council. The committee has participated in interviews and debates on CNN, BBC as well as other national and local TV and radio programmes. We have also participated in university debates in the US, UK and Ireland. 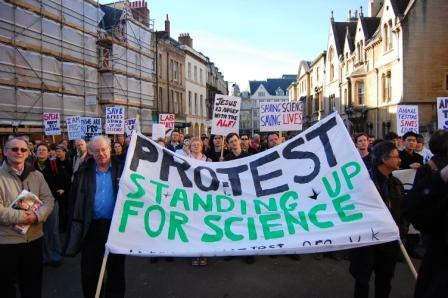 April 2009 – Speaking of Research support the formation of Pro-Test for Science and their first rally that attracted around 700 people. The Pro-Test Petition is also jointly announced by Speaking of Research, Americans for Medical Progress and Pro-Test for Science. April 2010 – Speaking of Research supports the second Pro-Test for Science rally where over 11,000 signatures from the Pro-Test Petition was handed to the NIH. June 2013 – Speaking of Research supports the first rally of Pro-Test Italia in Milan, standing up to the rising tide of animal rights extremism across Italy. February 2014 – An article about the misuse of images by animal rights groups becomes our first post to hit 100,000 views within one month. November 2014 – Speaking of Research launches its statements page which lists and rates the animal research position statements of hundreds of institutions. March 2015 – Speaking of Research revealed two leaders of the British Green Party had pledged to ban 88% of animal research. A spokesman for the party suggested the leaders had misunderstood what they signed and the party dropped its anti-research pledges in its next election manifesto. September 2017 – Speaking of Research makes its 1,000th blog post. September 2017 – Speaking of Research stands up for Christine Lattin, an early career bird researcher who was targeted by PETA. Our article results in hundreds of statements of support for Dr Lattin. April 2018 – Speaking of Research launches the Rapid Response Network to give both the scientific community and the public a voice.